Real-world data (RWD) are data relating to patients' health status and/or the delivery of health care routinely collected from a variety of sources. Real-world evidence (RWE) is the clinical evidence regarding the usage and potential benefits or risks of a medical product derived from analysis of RWD. RWE can provide information on diverse areas, for example, natural history and course of disease, effectiveness studies, outcome research, and safety surveillance. India has unique opportunity of conducting RWE studies in several interesting areas, for example, natural history of communicable and noncommunicable diseases and rare disease and Health Economics and Outcomes Research in public versus private hospitals. However, utility of RWE is challenged by diversity of information, large data sets of uncertain quality, and methodological rigor. For India, there are additional challenges in conducting RWE studies – Indian clinical practice pattern and physicians' interest in RWE studies. It is recommended that RWE studies in India should focus on health management issues of relevance to the country India and should be well planned to generate high-quality data. The United States Food and Drug Administration issued a guidance to industry in August 2013 on risk-based approach to monitoring. This prompted industry (sponsors and contract research organizations) to brainstorm, conceptualize, and implement risk-based monitoring (RBM) in their clinical studies and programs. The acceptance and implementation across the organizations have been variable in terms of pace and methodology. Published literature, commentaries, and views through Internet search were reviewed to understand the perceptions about RBM of different key stakeholders whose function has been significantly impacted, as these highlight ground-level challenges while implementing this major change. Some solutions are proposed to address these perceptions and challenges, as sooner than later RBM will become a way of life, given that recent ICH E6, revision 2 (November 2016) includes RBM in the document. Conceptual clarity, change management, skillset, and capacity building will be the key areas of focus to make RBM successful. Aim: Although drug-drug interactions (DDIs) cause major adverse drug reactions (ADRs) in patients under polypharmacy, the risk of some specific DDIs may be overrated in literature and different software. This study was conducted to determine the frequency and type of potential and clinically significant DDIs among inpatients admitted in a tertiary care hospital in South India. Materials and Methods: This longitudinal study was conducted for 30 days. Preformatted forms were used to collect data on the second day of admission. “Medscape Drug Interaction Checker” was used to evaluate and grade the DDIs. All the potential serious DDIs were intimated to the treating physicians and their responses in the prescriptions were noted. The same patients were followed up to evaluate the occurrence of any clinically significant DDIs. Results: A total of 763 drugs with 125 discrete types were prescribed in 155 patients with an average of 4.9 drugs per patient. One hundred and eight minor, 169 significant, and 24 serious potential DDIs were identified. Patient's age did not correlate, but number of drugs prescribed strongly correlated (P < 0.001) with the incidence of different types of DDIs. The prescription was modified in only 6 (25%) cases where potential serious DDIs were reported. Interestingly, no ADRs or impaired efficacy was observed due to the potential serious DDIs. Conclusion: There was a disparity between the potential and clinically relevant DDIs. Hence, clinical prudency is required before changing prescription due to potential DDIs reported by different software. Aim: This study aimed to evaluate the doctors' perspectives in using tools for diagnosis, prescribing medications, and devices for the treatment of asthma in Algeria. Methods: Data were collected from randomly selected physicians, pediatricians, allergists, and pulmonologists through a questionnaire-based survey in 12 cities and 60 rural locations across Algeria. 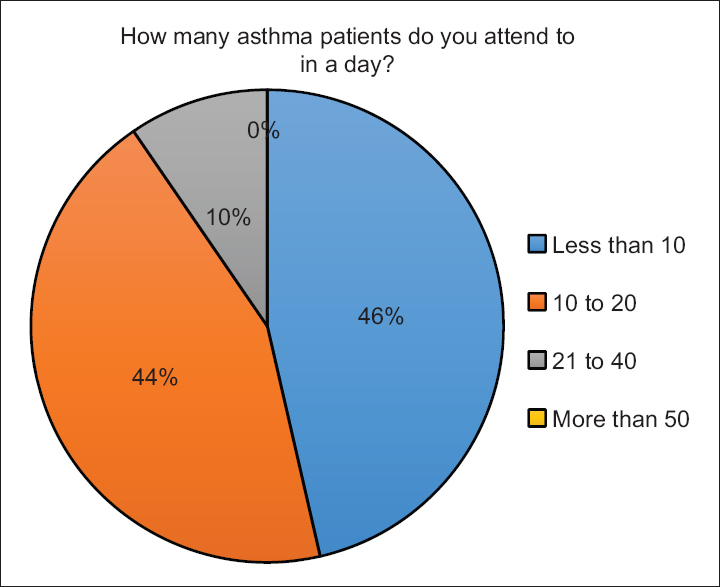 Results: Of the 213 doctors who responded to the survey, >90% doctors attended an average of 20 asthma patients daily. Peak flow meter was used by 69% doctors for diagnosis and by 93% for monitoring of asthma. Spirometer was used by 76% doctors for diagnosis of asthma. Budesonide (86%), fluticasone (46%), and beclomethasone (40%) were the most prescribed inhaled corticosteroid (ICS) by doctors. Formoterol/budesonide was the most preferred ICS/long-acting β2-agonist (LABA) (72%), followed by salmeterol/fluticasone (57%) for asthma treatment. Salbutamol was preferred by 93% doctors as reliever medication. ICS was the preferred controller in mild asthma (76%), and ICS/LABA combination in moderate (74%) and severe asthma (80%). Most doctors (94%) preferred pressurized metered-dose inhalers (pMDIs) with (46%) or without spacer (48%) for their asthma patients. About 83% doctors believed that pMDI with spacer would show a better outcome in asthma, over pMDI alone. Continuous exposure to allergens/smoking (73%) and incorrect inhaler technique (66%) were the most common reasons for uncontrolled asthma. Conclusion: The use of diagnostic tools in asthma was found to be adequate among the doctors in Algeria. Most of the doctors managed asthma in accordance with the global initiative for asthma guidelines. Spacers were found to be less prescribed in regular treatment, despite having good awareness about its better outcomes. Introduction: Research in medicine has an impact on prevention, diagnosis, and newer treatment for the medical ailments. It has brought reforms in policies for health-care programs. Involvement of undergraduates in research was less, so this study was planned to determine the factors and their perception toward the same. Objective: The objective of the study was to evaluate knowledge, attitude, experience, and the barriers of research among medical undergraduates. Materials and Methods: A cross-sectional questionnaire-based study was conducted after the protocol was approved by the Institutional Ethics Committee and obtaining written informed consent from participants. The predesigned validated questionnaire containing 34 questions was used. Filled questionnaires were received from the medical undergraduates of different phases of MBBS from our institute. Data were analyzed using descriptive statistics. Results: A total of 89% (267/300) responded, 140/267 were females. The knowledge score regarding the concept of research and its methodology was 2405/3458 (70%). Sixty percent strongly agreed to include research in undergraduate curriculum, 57% believed that it would facilitate better understanding of the subject and clinical practice (41%). Nearly 56% opined that research was not waste of time and does not interfere in studies. 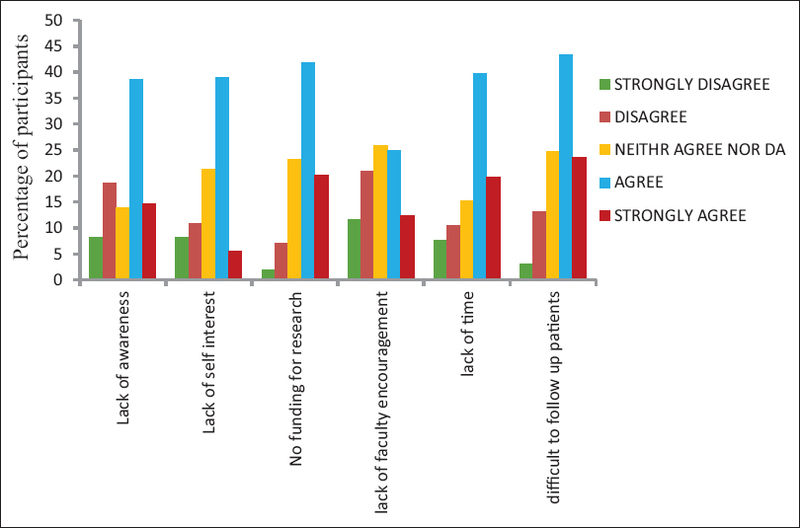 Barriers for research were lack of awareness (53%), interest (54%), funds (62%), time (59%), and difficulty in follow-up of patients (67%). Almost 59% of students disagreed to lack of encouragement by faculty. Conclusion: Most of the participants had knowledge regarding research and expressed positive attitude toward involvement in research activity. Some of barriers were lack of awareness, time, funds, and difficulty in patient follow-up. 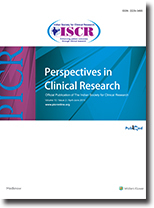 Aim: In this retrospective cross-sectional study, we sought to evaluate if the published randomized controlled trials (RCTs) reported in the year 2017 among the Indian medical journals (IMJs) complied with the Consolidated Standards of Reporting Trials (CONSORT) guidelines and identify domains where reporting could be improved. Methods: A literature search was performed using PubMed and Google Scholar to identify all the IMJs that published RCTs in the year 2017. In the archives of the identified journals, the number of published RCTs was identified and the full text was obtained. We selected articles that stated RCT in abstract and title and that evaluated the safety and efficacy of all therapeutic and preventive interventions. 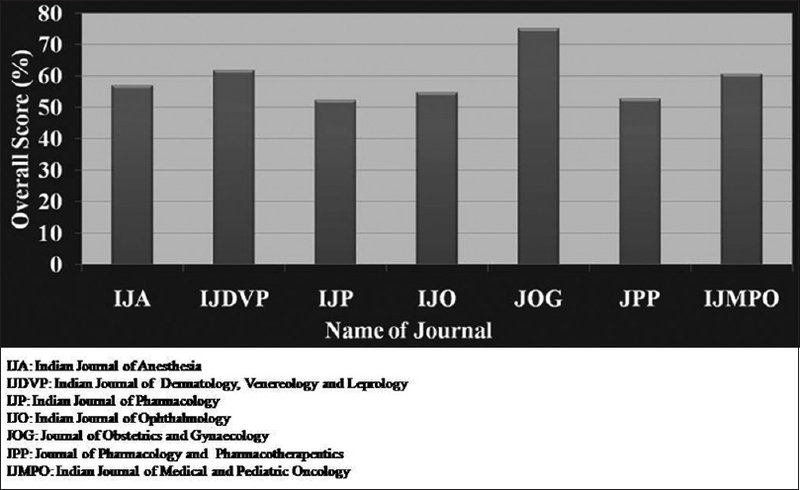 Results: A total of seven IMJs comprising of the Indian Journal of Anesthesia, Indian Journal of Dermatology, Venereology and Leprology, Indian Journal of Pharmacology, Indian Journal of Ophthalmology, Journal of Obstetrics and Gynaecology, Journal of Pharmacology and Pharmacotherapeutics, and Indian Journal of Medical and Pediatric Oncology that published a total of 84 RCTs were included. The mean compliance score of all the RCTs was 13.7 ± 2.66 (57%). Most RCTs had serious reporting deficiencies in the methodology and result sections. Discussion: In spite of journals making it mandatory for prospective authors to comply with the CONSORT guidelines, it is intriguing that there continues to be significant lacunae in reporting RCTs adequately in most IMJs. Conclusion: There is an urgent need to impart training to the medical community of our country in clinical research methods and reporting of RCTs. Purpose: The Prof. Ranjit Roy Chaudhury committee report recommended the accreditation of Institutional Ethics Committees (IECs). Rule 122DD of the Drugs and Cosmetics Act (and Rules) mandates that only registered ECs can accord approval for regulatory studies. We evaluated the current status of registered, reregistered, and accredited ECs in the country to assess the impact of both the recommendation and rule. Materials and Methods: Websites of stakeholders-the Central Drugs Standard Control Organization (CDSCO), National Accreditation Board for Hospitals and Healthcare Providers (NABH) were assessed. Information on registration status was then compared with regulatory clinical trials in the Clinical Trials Registry of India, population demographics of all states, and the Medical Council of India recognized postgraduate medical colleges in the various states. Results: A total of 1268 ECs were registered with CDSCO. Of these, 1008 (79.5%) were institutional and 256 (20.18%) independent ECs. A total of 499/1268 (39.4%) ECs were reregistered. Of which 449/499 (90%) were institutional and 50/499 (10%) were independent. 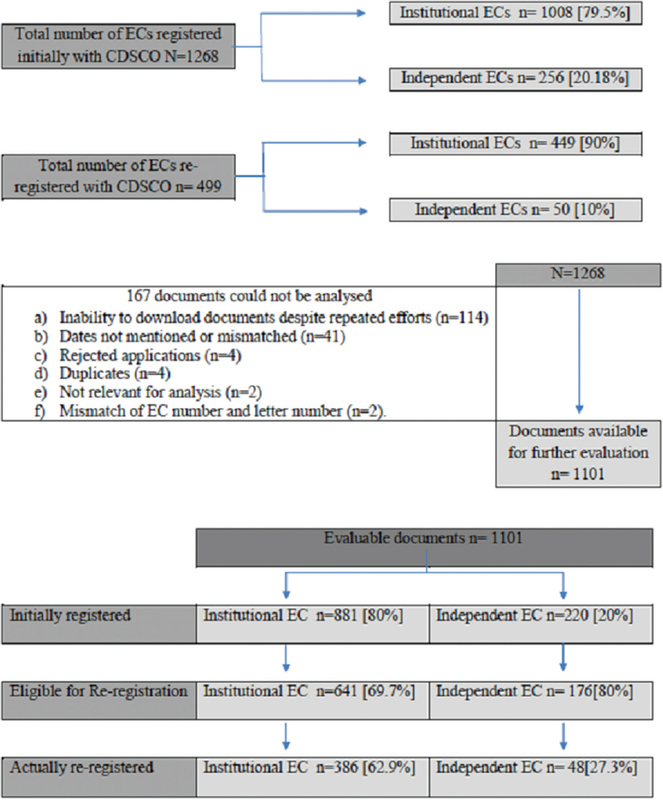 Institutional ECs were five times more likely to be reregistered with CDSCO relative to independent ECs (cOR 4.52 [3.12, 6.54], P < 0.0001). A total of 15/233 (7%) applications to NABH had received accreditation. A wide skew was seen in the distribution of ECs across various states as also their oversight of regulatory clinical trials. Conclusions: Registration and reregistration of ECs along with accreditation is not commensurate with the needs of the country at this time and must be vigorously promoted. In analytical observational studies, researchers try to establish an association between exposure(s) and outcome(s). Depending on the direction of enquiry, these studies can be directed forwards (cohort studies) or backwards (case–control studies). In this article, we examine the key features of these two types of studies. Aggregate reporting involves preparation and submission of safety reports for a given medicinal product to worldwide regulatory agencies and constitutes an essential part of safety monitoring of a medicinal product. There are specific aggregate safety reports required for a molecule in development called development safety update reports while Periodic Adverse Drug Experience Reports (PADERs) and Periodic Safety Update Reports/Periodic Benefit-risk Evaluation Reports (PBRERs) are submitted for products with marketing authorization. Based on the periodic analysis of worldwide safety reports, product label is updated to optimize safe use of a medicinal product. PADERs are aggregate safety reports to be submitted to the Food and Drug Administration (FDA) for products approved for marketing in the United States (US). PADER submission starts once marketing authorization approval is received for a medicinal product by the sponsor. Quarterly and annual PADERs should be submitted within 30 and 60 days of data lock point, respectively. PADERs mainly involve presentation of case reports with serious unlisted events (15-day alert reports) in the form of narratives or in a tabular format. The present article focuses on the background, scope, structure of a PADER, and its submission timelines; lists differences between PADER and PBRER; and describes the knowledge, skills, and attitudes required for a PADER writer.